The Minister of Environment and Tourism, Pohamba Shifeta, has not only activated an action plan to mitigate the predation of the Wild Horses of the Namib by spotted hyenas, but also invited relevant stakeholders to collaborate and assist where possible. 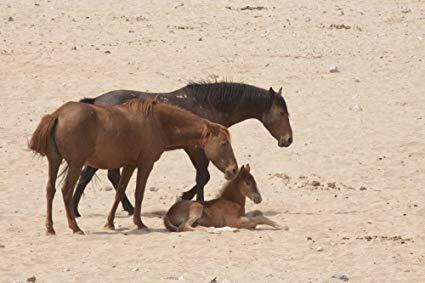 In the wake of the news that a little foal, born into the pack of wild horses about a week ago, was attacked an severely injured by the hyenas the Minister said in a statement that he has directed MET officials to ensure that the hyenas are removed from the Garub area. Mr. Shifeta said the ministry made good progress in an effort to address the concerns around the well being of the free roaming horses in the Namib Naukluft Park. The Minister said in his statement that he is hopeful that the interventions that were put in place will give the horses a relief for their population to recover. During the early 1990s the horse population was between 250 and 300 and now only 79 remain. The decline in the horse population is mainly attributed to the drought situation in southern Namibia and to the predation of foals by hyenas. The ailing condition of the horses has been receiving the Ministry’s attention through interventions designed to ensure their well being at a sustainable level. To this end, the Ministry has developed a Wild Horses Action Plan which covers among other activities predator management, water provision, tourism development, supplementary feeding and the development of a management plan that will serve as a long-term strategy for the management of the horses. The Garub area where the horses are is one of the hot spots for tourism in the country. The horses are also important as they form part of Namibia’s heritage. 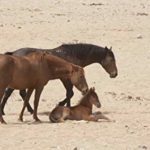 “The extinction of the horses will be detrimental not only to the Southern Region but to Namibia’s tourism in general and the Ministry will not allow such a situation to occur. Minister Shifeta said the environment ministry remains committed to the conservation of our wildlife and other natural resources for the benefit of our country and its people.